Pete Peterson was lucky. 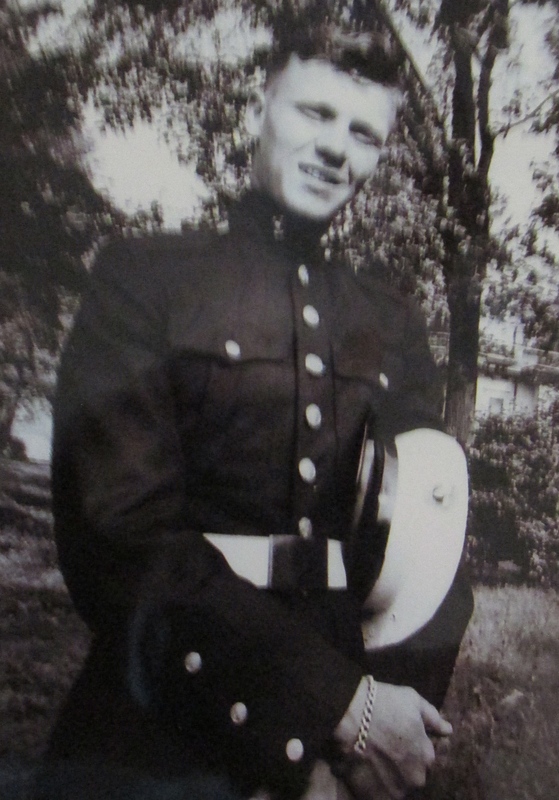 He joined the Marine Corps at 17 in 1946, a few months after the end of World War II. Three years later he got out of the Corps in 1949, a few months before the start of the Korean War. “After I got out of boot camp at Parris Island, S.C. I was sent to Quantico to be trained as an aviation mechanic. When I graduated I joined the permanent Marine Corps squadron at Cherry Point, N.C, VMF-222,” the 86-year-old Englewood Marine said. “I was promoted to corporal and given the responsibility of maintaining a single Corsair fighter plane. The Corsair was the finest Navy fighter plane in World War II. “While going through mechanic’s school at Quantico we had this instructor on carburetors. who when he wasn’t talking about carburetors, was talking about the Russians. He had been in the Marine Corps in World War II. Every once in a while he would get real serious about the Russians. “‘You guys are going to be fighting the Russians,’ he’d say. This was in 1948. He got our attention,” Peterson said. In Peterson’s case he fought no one. The closest he ever came to a shooting war were the fleet maneuvers they took in the Atlantic on occasion. “We would go out on some kind of a maneuver that lasted a month or two. The fleet might sail down to Guantanamo, Cuba or Ponce, Puerto Rico. At Ponce they had a big beach where the Marines would land on,” he said. Peterson’s time at sea was spent aboard the carrier USS Saipan (CVL-48), a light flattop, home to two squadrons of Corsairs–a total of approximately 50 fighter planes. Pilots spent their time making landings and takeoffs. “Some of our pilots were from World War II. We had a bunch of flying master sergeants. They were officers during the Second World War, but had been bumped down to sergeants after the war,” he explained. “We helped secure them when they jumped into their cockpits. You knew when you were securing a flying master sergeant he had been in World War II. “They were all pretty good guys. They all respected what we did for them. 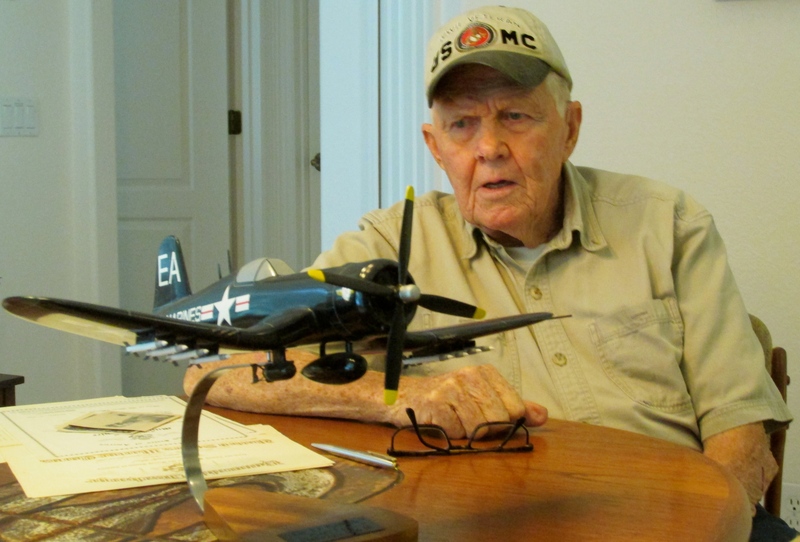 They knew their lives were in our hands because we were the people who kept their planes in the air,” Peterson said. There were occasions during Peterson’s sea duty aboard the Saipan when things didn’t go exactly as planned. Pilot’s tail hooks would fail to catch in the arresting cables and the plane would end up crashing into the barriers. When that happened Peterson and other ground crew members would first get the pilot out of the busted up fighter and then drag the plane out of the way so other Corsairs could land. This might take the use of their deck tractor and a lot of muscle power. After he was discharged, he went to work as the parts manager at the Cadillac dealership in Auburn, N.Y. After a few years he got another job helping run an oil tank farm in upstate New York. Then he and his wife, Carole, moved to the Englewood area in 1979 where Peterson took a job working for Sarasota Memorial Hospital. With a crew of 16 men they maintained all of the hospital’s air conditioning, heating, and other heavy equipment. The Peterson’s have a grown daughter, Donna Murray, who lives in Largo. Unit: VMS 222, Cherry Point, N.C. This story was first published in the Charlotte Sun newspaper, Port Charlotte, Fla. on Monday, Mar. 23, 2015 and is republished with permission. Click here to view Peterson’s collection in the Library of Congress VHP. 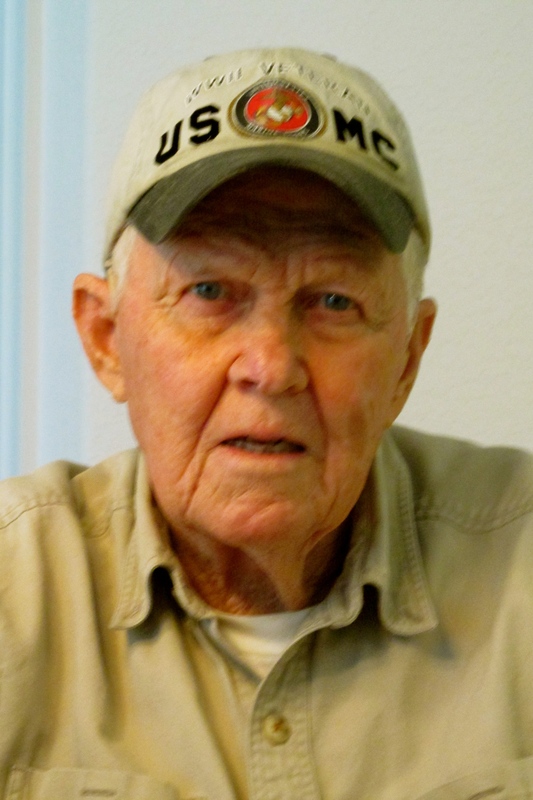 Eugene F. “Pete” Peterson 87, of Englewood, Florida died March 25, 2016. He was born October 29, 1928 in Auburn, New York to Andrew and Mildred (Lawson) Peterson. He is a member of the Good Shepherd Church of Englewood, Lemon Bay Region Antique Car Club, the Volvo Car Club of America and the Bergen American Legion Post for over 40 years. He is survived by his wife Carole Peterson of Englewood; his daughter Donna (Robert) Murray of Largo, Florida and 2 grandsons, Jon and Jay. A memorial service will be held at the Good Shepherd Church in Englewood on Thursday, April 7, at 11:00 a.m. In lieu of flowers memorial donations may be made to the Racing Dog Retirement Project or the American Cancer Society or a charity of your choice. The information about the Master Sergeant pilots was very interesting. What happened to them? There has to be an interesting story there. Pete Peterson is retired in Englewood, Fla. and doing just fine. I was interested in whether or not the Master Sergeant pilots eventually regained their former ranks or if they were simply passed over as the Navy converted to jet aircraft.